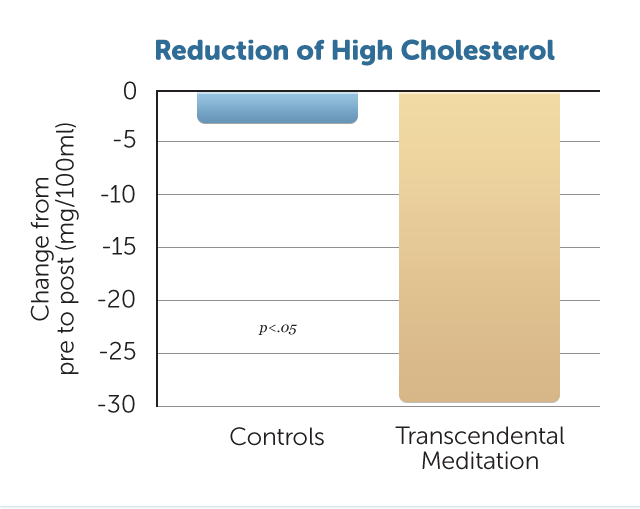 2 x 20 minutes of TM a day, demonstrated to have a much larger effect on reducing cholesterol than changes in diet or lifestyle. General wisdom states that cholesterol depends on eating habits. However, new research shows that stress plays a much bigger role than previously thought. When the normal functioning of the body is disturbed through accumulated tensions, the chance of having high cholesterol increases. On the other hand, when we activate our body’s healing power through transcending, then this turns out to have a much bigger effect on cholesterol than what can be achieved by merely changes in lifestyle. Two independent studies have measured the effect of TM on cholesterol. Dr. Oz: We can only hope to reduce cholesterol by 30 mg through medication. In a lecture on the effect of TM on the risk factors for heart disease, Dr Mehmet Oz, the world’s most influential heart specialist, stated that we can only hope to ever have cholesterol reducing medication that can lead to a 30 mg reduction (see America’s most famous doctors support TM) and that doesn’t even take into account the side effects of such medication. For the TM group the reduced cholesterol really was a ‘side-benefit’ of much deeper changes in all areas of life, which was expressed also in improved general health and well-being, development of the brain potential, better relationships, etc. I started with TM to help control my stress, and not at all with the intention to reduce my cholesterol. However, after one-and-a-half months of TM practice my LDL cholesterol had spontaneously reduced from 175 to 159, and overall from 230 to 214. My doctor was so impressed that he asked if I had made any changes to my eating habits, or had started working out, but that was not the case, it was all TM. Christophe Sempels, 36 years old.